Since Snapchat refused to sell to Mark Zuckerberg, Instagram has basically copied almost all of the features on the image messaging and multimedia mobile application. 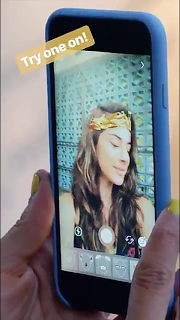 They've now introduced face filters in the camera "An easy way to turn an ordinary selfie into something fun and entertaining. Whether you’re sitting on the couch at home or you’re out and about, you can use face filters to express yourself and have playful conversations with friends." Read the rest of press release describing all the new functions below. "From math equations swirling around your head to furry koala ears that move and twitch, you can transform into a variety of characters that make you smile or laugh. 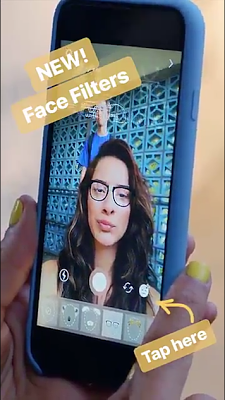 To see our initial set of eight face filters, simply open the camera and tap the new face icon in the bottom right corner. "Also today, we’re rolling out more creative tools in the camera. You can make videos that play in reverse with “Rewind,” a new camera format next to “Boomerang” and “Hands-Free.” Drop a microphone and watch it fly up into your hand. Capture a fountain in motion and share a rewind of the water floating back up. Experiment with some magic tricks of your own and defy the laws of physics wherever you are. "You can also add more context to your story with a new hashtag sticker. Just tap the sticker icon at the top right of your screen, select and customize the hashtag, then add it to your story. As with mentions, you can also add hashtags using regular text. People watching your story will be able to tap the hashtag sticker or text to visit the hashtag page and explore related posts. 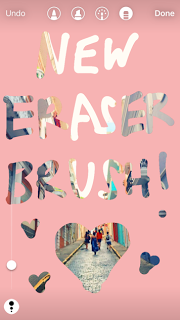 "Lastly, you’ll see a new eraser brush when using drawing tools. You can erase other things you’ve drawn and play around with removing color. After you’ve taken a photo or video, select a drawing tool and tap and hold to fill the entire screen with color. Then, using the eraser brush, you can creatively reveal parts of your photo or video underneath."